You’ve seen the ads floating around the inter webs. Buy this bundle sale! Short time only! Incredible resources! You look, think “That’s interesting, but holy cow, that’s an overwhelming amount of information.” Then you shut down that browser window as fast as you can to avoid the madness. I’m a huge fan of bundle sales and have found some of my favorite personal and business resources through bundles. Since I like to read and devour information (see StrengthsFinder: Input), I especially love having all the information I could ever want about any given topic readily at hand. 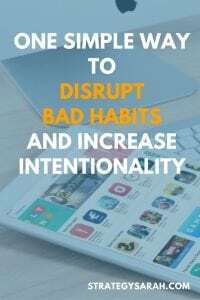 As we talk about making it easier to get life and business done, buying a bundle of resources – literally a whole grouping of books, courses and bonuses – might seem like the opposite of making life easier. 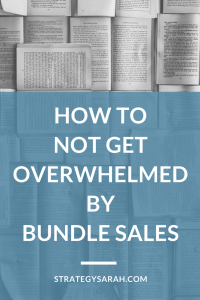 If you’ve ever bought a bundle, you’re likely to have sat there at least once, dumbfounded, staring at a list of resources, not having the faintest clue where to start. So why buy a bundle? Who has time for 67 resources?! You may be tempted to write off the idea entirely as too much to even know where to start. Don’t. You may just miss out on some incredible, life-changing information. What you need is a framework to remove the overwhelm so that you can use and apply the right resources that you got for a steal. Lucky you, the Strategy Sarah framework works perfectly to take the overwhelm out of a bundle sale. Step 1: Make a plan: Decide whether or not a given bundle is worth your time. If you’re a nerd like me (and you should be in this instance), you’ll do the math and determine how great of a deal a particular bundle really is. For me, the threshold for a deal is any bundle that has one or more resources I would pay full price for that cost more than the total value of the deal. For example, Bundle A costs $47 and has a course I’ve been eyeing that regularly costs $67. Sold. Bundle B might cost $27, but I’m only truly interested in one resource that costs $15. Pass. Action Step: When you come across a relevant bundle that’s a deal while it’s on sale, buy it. Bonus budget tip: I keep a stash of cash (not literal cash, but the electronic version that I track in YNAB) at hand for those hot deals that come up unexpectedly but are too good to miss out on. FOMO, anyone? You’ve already scanned the list of resources in enough depth to determine if there are resources that make the bundle a good deal. Now it’s time to dive deeper. Print the list of resources (or copy into your favorite tool like Evernote). Quickly scan the list of resources and highlight all resources that look potentially interesting. You likely mentally did this while you were making your purchase decision, but this time make it concrete. This step should take less than 5 minutes. Don’t spend a lot of time, but scan the titles and descriptions and see what fits. For some bundles, not as many of the resources are immediately applicable and this first step provides an easy list to prioritize. For others, most of the resources are appealing and this may feel like it didn’t narrow down much. Side note: One of the many reasons I love and am an affiliate with Ultimate Bundles is their focus on making bundles accessible in a non-daunting way. 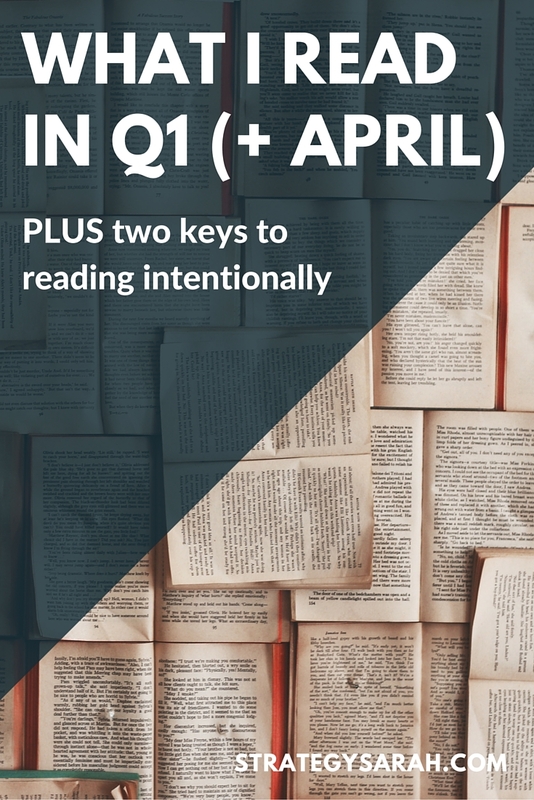 Every bundle comes with a Getting Started guide that lists out all of the resources by type (book, course, printable, etc) and by level (beginner, intermediate advanced). This makes it so much easier to review and prioritize! Rank order your highlighted resources. Review your list of highlighted resources. If you have five or fewer, rank order them in order of importance and move on to step 3, Take Action. 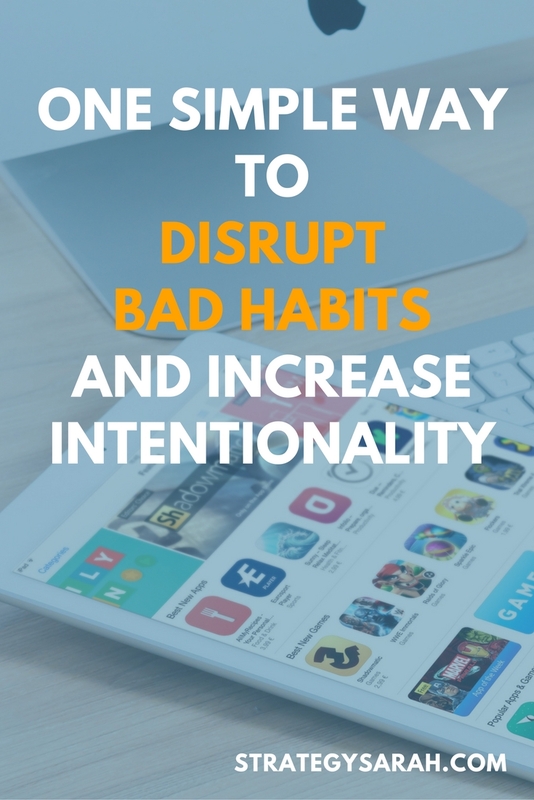 If there are more than five, review the entire list again and ask yourself, “Will this make an immediate positive benefit on my life?” Place a 1 next to those resources. Place a 3 next to all remaining highlighted resources. Review your list of items marked with a “1” and rank order them in order of impact. That’s where you start! Action Step: Prioritize resources you’re going to use and get ready to get started! Download the individual resources you listed in step 2 as once you will use. Many bundle sales have an easy “Download All” button. If you’re interested in more than 3-4 of the resources in a bundle, this is usually faster than downloading individually. However, I highly recommend that you immediately delete any resources that didn’t make your prioritized list. You don’t need more reasons to be distracted! Digital clutter is just as real as physical clutter. You have a clear plan of what resources you’re going to use, and they’re safely downloaded and filed on your computer. Yay! Review your calendar and block off time specifically to work through these tools. Failure to plan is planning to fail. Cliche, but true. Identify specific time to work through bundle resources, clear your calendar to make it happen, and don’t let amazing resources gather dust. Action Step: When the scheduled work time pops up on your calendar, you have a clear plan of action and are ready to focus on taking the next step forward! The 2018 Ultimate Homemaking Bundle is live now through April 16. If you’re like me, you may see the title “homemaking” and assume if you’re not a stay-at-home-mom that it’s not for you – but it is! Reading! FREE three month subscription to Scribd, which I’d classify as “Netflix for books + audiobooks” worth $26.97. This alone sold me – if I were to pay for this – which I would – everything else is practically FREE. 3 Style + Fashion resources worth $176. I need all the help I can get here! 9 Time Management resources worth $254.00. 10 Work at Home resources worth $1,302.99. If you have a home, get dressed, eat, or read, click here to check out the Ultimate Homemaking Bundle before it’s too late. How many times have you looked at something, thought “That’s just way too much information to digest” and ignored the entire thing? Or sat down to complete a specific task and realized that you don’t even know where to start because there is so much to focus on? 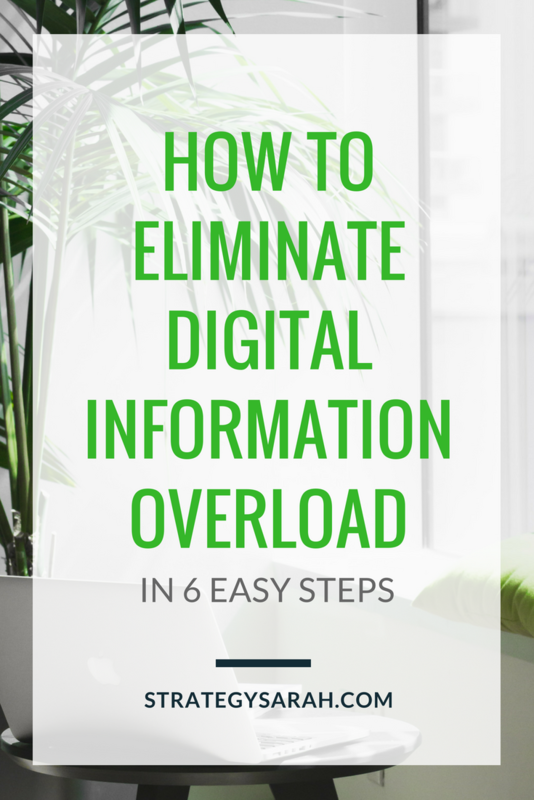 Do you wish there was a way to eliminate information overload? It happens to the best of us. Don’t let it happen to you! (Or if you’re already there, let’s dig out together). 1. Grab your beverage of choice, and power up your computer (pad, or smartphone, or whatever device you’re working off of). Personally, I’m a fan of coffee or kombucha, depending on the time of day. Everything is better with coffee. And if you’re overwhelmed by a large volume of information, you’ll likely start off a little less overwhelmed working off a computer rather than a pad or phone. 2. Download everything and save it in one place. 3. Do a quick scan and delete anything you know you won’t use. Is it something you will realistically ever use? If not, delete it now and forget about it. If that’s too hard, create a sub-folder titled “Delete.” Then set a reminder for 90 days from now to delete that folder. (If you’re not already using a task management or project management tool, an easy way to set a reminder is to send yourself a digital calendar meeting invite or mark it on your printed calendar.) If you haven’t used any of the files in 90 days, the chances you ever will are slim. This should take less than 2-5 minutes, unless you have a ridiculously large number of files (and by ridiculously large, I’m talking into the several hundreds or thousands). Do a second quick scan and move any files here that you know you want to use in the immediate future. Be ruthlessly honest with yourself about what you actually have time to use and/or truly need to use in the immediate future. In a majority of cases, this folder should not contain more than 3-5 items. Do you have a robust file system in place? If so, file any remaining items accordingly. If not, create another general folder titled, “Save for Later.” Set a reminder for 60 days, and repeat the review process for this folder. 6. Close all folders except your “For Immediate Use” folder. You have now prioritized what information truly matters right now. Take a deep breath, and dive in! 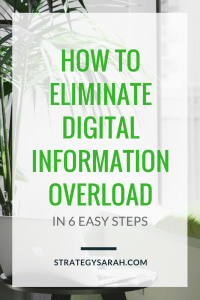 Have you tried these strategies to eliminate your information overload? What’s working for you?